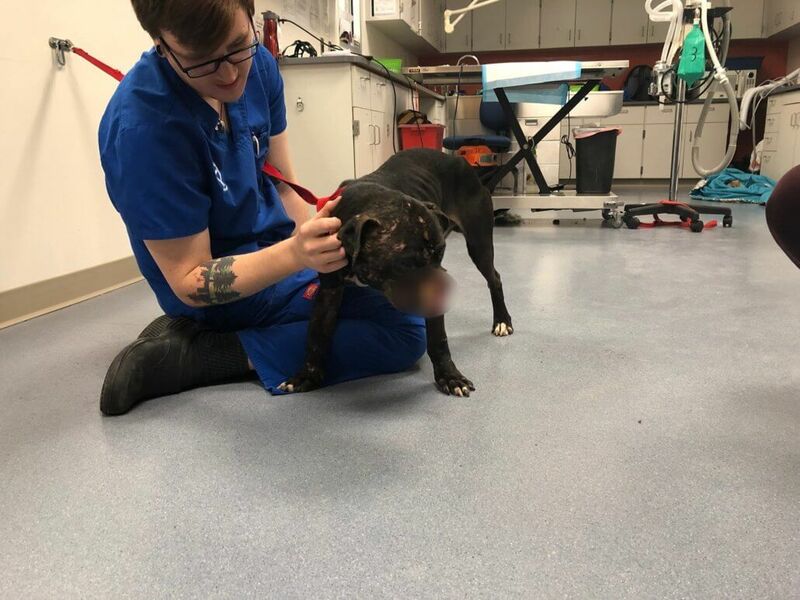 Staff at Pittsburgh’s Humane Animal Rescue were amazed at the demeanor of an injured dog who was brought in by City of Pittsburgh Animal Care & Control officers on Monday – despite having a maimed face, the pit bull, dubbed Bruce, was up and walking around and he seemed happy. He was found to be severely undernourished and emaciated with extensive bite wounds and facial and skull damage that was thought to be several weeks old. Once the extent of the damage was more evident, it was determined that the majority of Bruce’s upper jaw, two-thirds of his nasal cavity, his right ear canal, and right eye would need to be removed. Three PVSEC Board Certified Surgeons considered the extent of Bruce’s injuries, his poor body condition, and quality of life to determine that not only would Bruce have a difficult time surviving through multiple surgeries and healing process, but that he would have a very poor quality of life is he did survive the reconstruction process. They recommended that Bruce be humanely euthanized. If you suspect abuse, neglect, abandonment of pets, or animal fighting within Allegheny County, please contact our Humane Investigations Department at 412-345-7300 ext.245 or Investigations@HumaneAnimalRescue.org. Speaking up for animals means saving them from a life of neglect. Rest in peace Bruce, we can only hope who ever let you get in this condition will rot in Hell! I SINCERELY HOPE that an ORGANZATION will OFFER Such A REWARD one of the Bastards in the Knowing will “RAT” out the “Worthless ,No Account Vermin” that ALLOWED this to happen!!! I would venture to SAY BRUCE WAS BAIT!!!! There are member’s of Law Enforcement that KNOWS who is doing this Crap!!! STAND UP !!! Many many tears for dear sweetheart Bruce! But you will now run and play with the other angels in heaven! RIP Bruce, your life DID matter. Law enforcement have eyes and ears everywhere, they need to round up these vermin and put them in a pit with rattlesnakes! RIP Bruce. You were a sweet dog who was probably used as bait for dog fighting. This country needs to put an end to this once and for all. Law enforcement know who and where there are dog fights and in some areas, part of the problem and look the other way. Dog fighting is illegal yet it thrives in some parts of our country. There should be a hotline where you can call and report suspected dog fighting which can be a start. Rewards to find those who are part of these fights. Money talks and there are people who will rat on a friend if it is worth the money.